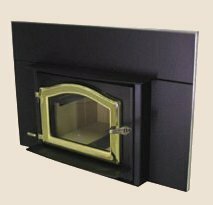 Designed as a big heater for masonry fireplaces, the Sequoia fireplace insert is able to handle a large load of firewood for a burn-time up to 14 hours. It is approved for use in masonry fireplaces only and can be installed with or without a stainless steel liner. It features a full convection design that does not require a blower to heat effectively, and a super-efficient catalytic re-burn system.